Dien Bien province is the neighbor province of Lai Chau province and Son La province. Dien Bien is also located in the North West of the country. It borders with Van Nam province of China and some towns of Laos to the west and the south. Center city: Dien Bien Phu City locates in the north east of Dien Bien province. Districts: Dien Bien District, Dien Bien Dong District, Muong Ang District, Muong Cha District, Muong Nhe District, Tua Chua District, Tuan Giao District and Nam Po District. Tourist districts: Dien Bien Phu city and Muong Lay Town. Climate: the climate in Dien Bien is the tropical monsoon of the highland. There are different climate region in the province. However the typical thing is that the winter in this province is cold and in the summer, it is hot and rain but the rain is usually not stable. The temperature in the province is from 21 to 23 C degree in average. Ethnic groups: There are more than 20 ethnic groups who live together in the province. The main groups are Kinh people, Thai ethnic group and Hmong ethnic group. Dien Bien Phu Battle: or Dien Bien Phu historic siteIt is the large area with many hostorical relics that tell you about the long time in the time war in Vietnam with many historical events. U Va hot spring: the hot spring locates in Dien Bien district. It is far from Dien Bien Phu City more than 15km. This is the natural hot spring with its square that is more than 70.000m2. The temperature of this spring is from 76 to 84 C degree. Hua Pe Hot spring: locates in Dien Bien district also. However this hot spring is nearer than U Va hot spring. Hue Pe hot spring is far from center of Dien Bien Phu City about 5km only. The temperature here is lower than in U Va hot spring, it is about 60 C degree in the water. Muong Thanh Field: this is the endless yellow rice field in Vietnam. Muong Thanh rice field is considered the largest rice field in the North of the country. It is about 20km long and 6km wide. Pa Khoang Lake: after the famous name is Muong Thanh rice field, Ho Pa Khoang is the second famous destination that mentioned each time people talk about Dien Bien province. 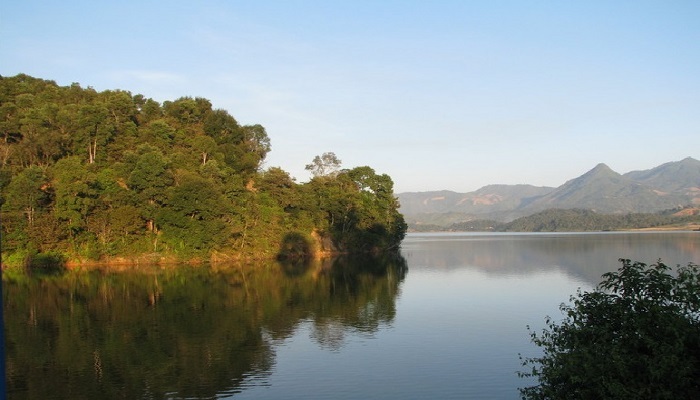 The lake is in Dien Bien district. It is far from Dien Bien Phu about 20km. The huge lake is the attractive landscape that fascinates people strongly. Pha Din Pass: the pass is considering the soft silk that is more than 30km long. It is one of four best pass in the North with the great site along the pass. Muong Lay Town: called the Ha Long in the highland, Muong Lay Town is the potential tourist town of Dien Bien Province. You can find out here the best natural picture with the endless rice field from the Ma Thi Ho Pass. The great landscapes are created by the well-known rivers such as Da River, Nam River. Enjoy the peaceful life of local ethnic people with their rich culture. Muong Nhe Naure Reserve: locates in Muong Nhe District. This is one of the largest nature reserves in the country where you can explore the rich fauna and floral system. Ta Sin Thang local fair: the fair happens romantically in the highland area where you can understand more about the trading activities of the local people. Beside, this is one of the ideal places for you to explore the local ethnic culture. Tu Cai Festival: the big festival happens in 24th and 25th February in Lunar year. Com Moi Festival: the festival belongs to Si La ethnic group. It happens in August of Lunar year. Thanh Ban Phu Festival: is in Dien Bien District. It happens in 24th and 25th February in the lunar year. Han Khuong Festival: happens in Dien Bien District. This is the festival of Thai People that organized in November each year. Om din om dang festival: or called the rain falling festival. It is the festival of Kho Mu ethnic group. It happens in the end of March and the beginning of April in the lunar year in Dien Bien Dong district. And there are some unique festivals of other ethnic groups in the province. There are not so much local specialties in Dien Bien like in the other provinces in the North West of the country. However the specialties here in the province are not easy to find in the other places. There are some unique things in Dien Bien that you may love to bring home for gift or enjoy in the time of staying in this province. The specialties here are the rice, the black chickens from Tua Chua commune, hoa ban vegetable, the local tea in Tua Chua commune, local liquid, local sticky rice, local spice, steamed pork in banana leaf, grilled fish and duck braised with banana flower and some other typical things.